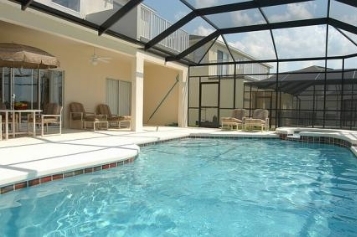 The LUXURY POOL measures 30' x 15' and has been extended to give you extra enjoyment. There is also an 8' diameter raised SPA bath for the ultimate in relaxation. A waterfall running from the spa into the pool provides a soothing background for when you're relaxing around the deck. Once out there you won't want to go back in for anything so we've even provided a cabana shower outside on the deck so you can cool off! The south facing proximity of the pool and deck area guarantees Florida sunshine throughout the day for 12 months of the year. For the safety of children the outside pool area is equipped with a safety fence that extends the whole length of the deck. This stunning extended deck is one of the largest offered by any house-builder in the region. However, we wanted even more for our guests, so we've extended it even further to give an exceptional feeling of space. Overlooking a natural lake and woodlands it gives a feeling of tranquillity and peace. When the sun gets too much for those guests wanting some shade, there is a large covered LANAI. With ample patio furniture as well as a plush 6 seater dining table, the lanai also provides a nice area to eat meals 'al fresco' or to sit and relax with an evening drink and watch the sun set.